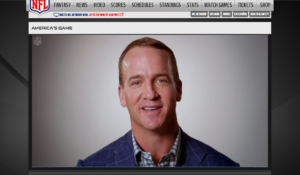 Peyton Manning has it down; wear strong colors and interesting patterns that don’t detract from the viewers eye. I told him as much when we worked on this video together for the NFL in Denver at the Broncos training camp. He nodded and smiled at me, he’s been at this party for a long time. For many of us, though, it IS a new party, and we don’t know what to wear on camera. For you, I have created a handy dandy write up on what to wear. For every talent that goes on Gaia TV, they recieve one of these in an email, and, if they actually read it, it makes me much less cranky when they show up in proper attire. Enjoy! This turns you into a human light bulb. Unless you are Dracula, please avoid. Brown, unless it is a rich espresso type brown because beige, cream, or light brown does nothing for you. Loud patterns such as plaids, stripes, checks or anything that yells louder than you do. Shiny jewelry. Not only do fairy’s steal shiny jewelry, it will catch the audience’s eye before you will. Logo’s on a shirt, unless it is your own marketing campaign, like fairies for hire. Colors in the medium range like blue, green, maroon, wine, rose, charcoal gray, purple, etc. If your hair is light, then lighter colors better: light blue, pink, pastels, etc. If your hair is dark, stick to medium dark range colors, while avoiding black. Accessories like scarves, ties, etc. They should be non reflective or shiny and have minimal patterns, but complement your outfit. Small prints and patterns are acceptable as long as they aren’t clearly visible from 10 feet away. Pinstripes, small checks, paisleys, etc., are all fine. It is always wise to bring a few options of shirts and ties for men, and tops for women in case you have a wardrobe malfunction (long live Janet Jackson). And remember, always be nice to the makeup artist; I’m making you look good.